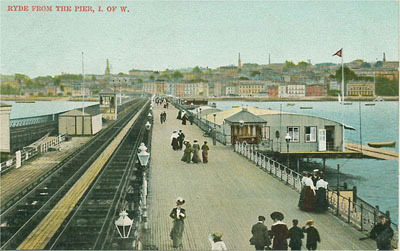 Ryde's pier is the second-longest seaside pier in the country. Only Southend pier is longer. 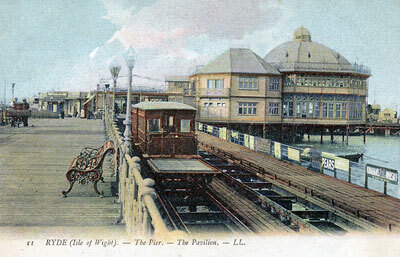 The original wooden structure at Ryde opened in 1814. At 1,740 feet, it allowed ferries to berth even at low tide, when the sea retreats half-a-mile from the shore. It was extended in 1824, and reached its present length of nearly 1/2 mile by 1842. 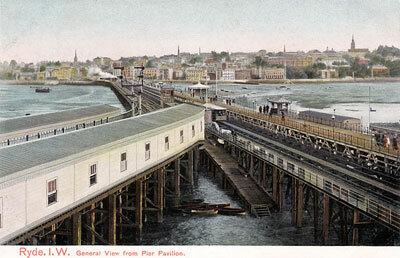 Ryde Pier is really three piers in one, the original pier was just the Promenade and the pier head for the steamers. A second, parallel pier was built in 1864 to support a horse-drawn tramway. This ran from the pier head as far as the pier gates and then through the town to provide a connection for steamer passengers with Ryde's original rail terminus at St John's Road, a mile to the south. A tram used this pier until the 1960's, although horse-power had been replaced by diesel power and it only ran between the pier head and esplanade. As previously stated, the trams ceased in the mid 1960's, about the same time, the railway line was electrified and ancient London Underground rolling-stock introduced. In the Summers of the 1950's/60's, it wasn't unusual on a Saturday to see people queuing half way down the pier waiting for a ferry to take them across the water on their way home after their holiday. At various times, the pier accommodated Ryde Lifeboat (1869-1922), Ryde Rowing Club (1877-1968), Trinity House Pilot Station (1970-1995), a pavilion concert hall, various bars etc and more. The pier also served as the operating base for Wightline Cruises and Blue Funnel Cruises.